License of the Ministry of Education and Science of Ukraine AE No. 458568 dated 28.07.2014. Form of ownership – state-owned. Academy provides higher educational services for Bachelor's and Master's degrees in specialties "Law", "Law-Enforcement Activity" and "Psychology", a master's degree in the field of “Public management and administration”, as well as degrees of Doctor of Philosophy and Doctor of Sciences in specialties "Law", "Psychology" and "Philosophy". Training of specialists is carried out in full-time and part-time on a state-commissioned basis – for the Ministry of Internal Affairs of Ukraine, the National Police of Ukraine, on terms of a separate contract – for other central executive bodies, whose activities are directed and coordinated through the Minister of Internal Affairs, as well as training at individuals or legal entities expense. Higher educational establishment provides services for more than 18,000 students in full-time and part-time forms. In its structure - doctoral school, training institutes, Institute of Postgraduate Education, Institute of Penal Service, Faculty, Juridical Lyceum. Training process and research activity are provided by 29 departments and five specialized scientific laboratories (42 Doctors of Sciences and professors including four academicians and correspondent members of branch academies of sciences, 201 PhDs and associate professors). Five specialized scientific councils on the defense of doctoral and candidates’ theses operate on the basis of the NAIA, and five scientific journals are issued. Reputable research schools have been formed and successfully developed. Academy is a member of the Association of European Police Colleges, a member of the Conference of Heads of Police Universities of Central and Eastern Europe, maintains cooperation with international organizations, educational institutions and police agencies in many countries. Research and teaching staff, applicants of higher education and Lyceum students of the Academy are regular participants and winners of contests for the prizes and scholarships of the President of Ukraine and the Government, the National Academy of Sciences of Ukraine, Ministry of Education and Science of Ukraine, the Kyiv Mayor, the Union of Lawyers of Ukraine. Academy’s staff has status of reserve staff of the Ministry of Internal Affairs and provides support to the capital police garrison to ensure the protection of public order during mass events in Kyiv and region. Thus, gradually strengthening its capacity according to the requirements of the Ministry of Internal Affairs of Ukraine, the Academy is currently developing in all areas of innovative educational activities and has established itself as a leading research and methodological center, a base institution for the preparation of a new generation of law enforcement officers. For almost ninety years of its history, the National Academy of internal Affairs has become the flagship of departmental education. As time went on, changing the names of the educational institution, its authority has remained unchangeable. The history of the establishment of the Academy takes its origin from the 11th of June 1921, when “Chervony Militiamen Courses” began to function at Kharkiv militia. And this date is considered to be the birthday of the National Academy of internal Affairs. After a year, “School for Senior Officers of Workers' and Peasants' Militia of the USSR” was established on the basis of “Chervony Militiamen Courses”. At the session of the Council of people's Commissars of the USSR on December 25, 1922 it was decided to reorganize the school of militia to “All-Ukrainian School” and secure it with state provision. Based on this decision during 1923, the People's Commissariat of Internal Affairs made the necessary organizational measures and by order of militia and criminal investigation Department of the USSR on October 23, 1923, the school was renamed to “All-Ukrainian School for Militia and Criminal Investigation”. Thus, the institution received the national status and began to prepare senior officers to militia agencies all over Ukraine. In 1925, the “All-Ukrainian School” was relocated from Kharkiv to Kyiv, where it got an area on Batieva Hora (Hill) (now the building of the secondary school № 60). Since 1936, the educational institution was renamed to “School for Senior Management Staff of Workers' and Peasants' Militia after V.A. Balytzky”. After a year, this educational institution was called "Kyiv School of Perfection for Management Staff of Workers' and Peasants' Militia". In this status the school had been working by 1941, before the beginning of the Great Patriotic War. At the end of the war on 25th March, 1944, in accordance with the order of the NKVS of Ukraine, “All-Ukrainian NKVS School of the Ukrainian SSR” started its work in Kiev. Aftermath, it subsequently underwent a series of reorganizations and was several times renamed: “All-Ukrainian School of NKVS” (1944), “Kyiv School of NKVS” (1946), “Kyiv Officer School of the Ministry of Internal Affairs” (1948), “Kyiv School of MIA of the USSR” (1950). On August 20, 1956 “Kiev Specialized High School of Militia of the Ministry of Internal Affairs of the USSR” was organized by the order of the Ministry of Internal Affairs of the USSR, which started to train specialists for the core services of militia with a two years’ training period (at correspondence department three years). Being transferred to Lviv, the school was located in the premises of Fire-technical College, built in the postwar years by the architect O. A. Pleshkov. In 1957, the Department of distance learning of Higher School of MIA of the USSR was created on its base, and in 1958 - the Kyiv Office of the High School of MIA of the USSR by the order of the Ministry of internal Affairs of the USSR from March 21, 1958. On April 11, 1960, the government adopted a decree on the establishment of the “Higher School of MIA of the USSR” by merging the branch of the “Higher school of MIA of the USSR” and the “Kyiv Special High School of Militia”. In 1962 the name of the institution was changed; it was connected with the change in the name of the Ministry. The school was named to the “Higher School of the Ministry of Public Security of the USSR”. In 1966, through changes in the structure of the Ministry, the school was subordinated directly to the Ukrainian Ministry, and it was called the “Kiev Higher School of MPS of the USSR”. Since 1968, the institution was known as the “Kiev Higher School of MIA of the USSR”. Considering the increasing role of the KHS of MIA of the USSR in training of the personnel for interior agencies on September 8, 1977, the school was named after F.A. Dzerzhynsky by the Council of Ministers of the USSR. After the proclaiming of Ukrainian independence in 1991, the educational institution was called the “Kyiv Higher School of the Ministry of Internal Affairs of Ukraine”; and in 1992, the “Ukrainian Academy of Internal Affairs” was founded on its basis. In December 1996, according to the decree of the President of Ukraine, it received the National status; and it was called the “National Academy of Internal Affairs of Ukraine”. After having joined in the Bologna process in May 2005, Ukraine had to reorganize the system of higher educational institutions, including departmental ones. In this regard, on September 8, 2005 the Academy was reorganized in the University and received the name of “Kyiv National University of Internal Affairs” in accordance with the decree of the Cabinet of Ministers of Ukraine. The national status the University was confirmed on September 15, 2005, by the decree of the President of Ukraine "About preservation of the national status of some higher educational institutions". 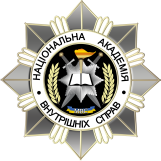 On August 27, 2010 KNUIA was reorganized in the “National Academy of Internal Affairs” by order № 1709-p of the Cabinet of Ministers of Ukraine "On the Reorganization of Some Higher Educational Establishments of the Ministry of Internal Affairs". On August 31, 2010, this higher educational establishment maintained the national status by decree № 887/2010 of the President of Ukraine "On the National Academy of Internal Affairs". The veterans’ organization of the academy was created on November 24, 1995. Its first Head was Petro P. Mykhailenko, an academician of the National Academy of Laws, doctor of legal sciences, professor, a lieutenant general of the internal service; the Executive Secretary was Oleksandr S. Gordetsky, a colonel of the internal service. - 75% of the veteran organization of the academy are veterans of the Internal affairs and labour veterans. In October 2003 the veteran organization of the academy joined the Association of the veterans of the ministry of internal affairs of Ukraine, headed by Volodymyr M. Korniychuk, a lieutenant general of militia. On December 17, 2009 the meeting held to hear reports and elect new officials elected 41 members to the veterans’ administration. Yuriy G. Kobrinsky was elected as the Head; the first Vice-Head is Volodymyr D. Kukharenko, a professor of the Economic and Legal Disciplines Chair, Vice-Heads are Oleksiy Y.Starodub, Volodymyr S. Zaets, Anatoliy V. Dovbnya, Rostyslav V. Kalyuzhny. The honorary head of the organization is Volodymyr D. Babkin, doctor of legal sciences, professor, honored Master of Science and Engineering of Ukraine, academician of the Ukrainian academy of the political science. For the operative management of the veterans organization there was formed the presidium and the Executive committee of the Organization. In order to assist every veteran, the primary veteran cells are being formed. This work is to be continued. The main aspect of work is to promote social protection of the veterans, participate in the national, patriotic and professional education of the intended law enforcement officers. These Commissions are run by A.A. Lukashenko and V.D. Kukharenko. 1. 05.04.2019 The Head of the European Union Advisory Mission had a meeting with cadets at the National Academy of Internal Affairs On April 4, 2019, the rector of the National Academy of Internal Affairs Volodymyr Cherniei, together with the Head of the European Union Consultative Mission in Ukraine, Kęstutis Lančinskas had a meeting with the Academy's students.